SANTIAGO, Chile, Jan. 17, 2019 /PRNewswire/ -- Bechtel, a global leader in engineering, procurement and construction, has received approval from Teck to proceed with the expansion of the Quebrada Blanca copper mine in Chile, comprising a143,000 tonnes-per-day copper concentrator, a high-capacity desalination plant, and a 165-kilometer water supply pipeline. "We are very proud to be working with Teck to develop the Quebrada Blanca Phase 2 Project. Working together with Teck we have developed a capital efficient design and, in the field, we will be applying innovative productivity methodologies to deliver the lowest possible construction costs in Chile. 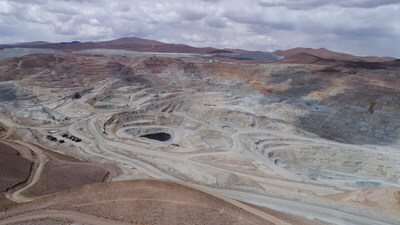 The project offers a great opportunity for Bechtel and Teck to deliver industry best results building the largest copper project in Latin America," said Paige Wilson, president of Bechtel's Mining & Metals Global Business Unit. Bechtel's global experience includes delivering more than 40 major copper projects, as well as other major projects in the mining and metals industry, and a 60 percent increase in copper production capacity in Latin America over the last three decades.